Just 220 yards from central Knysna's waterfront, this hotel combines traditional wooden architecture with modern facilities. It features landscaped grounds, an outdoor pool with wooden sun deck, and free private parking. Rooms at The Graywood Hotel offer garden views and are decorated with white linens and rustic wooden furniture. They are all air conditioned and include cable TV channels and a bathroom with bathtub. Buffet breakfast is served in the Blue Goose Restaurant, or on the wooden sun deck overlooking the courtyard garden. Drinks can be enjoyed at the bar, featuring a vintage train theme. Located 330 yards from Choo-Tjoe Train Station, the hotel Graywood is a 5-minute walk to the ferries and a 25-minute drive from Plettenberg Bay. The natural surroundings provide plenty of outdoor activities. This beautiful Cape Colonial guesthouse is located just off the the main road of Knysna and offers stunning views of the picturesque Knysna Lagoon and the well-known Knysna Heads. Hide-Away Guest House will be your home away from home and is only a 15-minute walk to the town centre and the bustling Knysna Waterfront. Hide-Away Guest House is the ideal place to simply relax or from which to explore the many sights of Knysna and the scenic Garden Route. For the more energetic, a mini gym is also available on site. Your South African hosts, Cecil and Colleen Harding, own and manage Hide-Away and will ensure that you have a memorable stay in this remarkable piece of paradise in the Western Cape. This guesthouse offers spacious rooms with free Wi-Fi and panoramic views of the lagoon and Knysna Heads. It features a swimming pool with a sun deck and a library. Villa Afrikana Guest Suites feature a blend of African and contemporary décor. All rooms have deluxe bedding and down comforters. Custom bathroom amenities are provided in each private bathroom. Most rooms have private balconies which offer stunning views of Knysna’s magnificent lagoon. All balconies feature a table and chairs or lounge chairs. Villa Afrikana has easy access to South Africa’s popular Garden Route. It is a mile from Knysna Waterfront Ferries. Pezula and Simola Golf Courses are a 15-minute drive away. A self proclaimed “place of rest” in the heart of the Garden Route, this lodge is between the town of Knysna and the famous Knysna Heads. The hotel has a relaxing atmosphere surrounded by a quiet landscape. The location is only 5 minutes from the center of town and allows for easy access to many attractions in the area, from playing golf at one of the many world-class courses, to hiking on one of the many trails in the area. The range of activities is extensive. The lodge also offers a great “tree-top” breakfast, a sparkling, rim-flow swimming pool and your own private entrance and balcony. This stylish, 4-star guest house on the famous Garden Route overlooks the Knysna Lagoon. It offers spacious rooms with wonderful views, and a garden with a modern swimming pool. All of the rooms at the Cambalala Guest House feature a private balcony, floor heating and Wi-Fi internet access. The Cambalala Guest House's large breakfast buffet is served until lunchtime. Furthermore, the guest house offers a communal open-plan lounge, a dining area and a kitchen area. The modern swimming pool is located in the Cambalala's garden area. Cocktails are also served here. The shops and restaurants of Knysna's waterfront are just a 10-minute walk away. Secure parking spaces away from the street are available at the Cambalala. Knysna Manor House is in a charming Victorian mansion that offers stunning views of the Knysna Lagoon. Guests will immediately enjoy the historic charm of 100-year-old Knysna Manor House. From the original yellow-hardwood floors, to the character of each individual room, the Victorian theme is carried throughout this enchanting house. There are a variety of rooms that enjoy soothing earth colors, creating a cozy atmosphere. All rooms contain tea trays, a hairdryer, and tea/coffee making facilities. Knysna Manor offers a wide array of dishes. Enjoy breakfast in the dining room or on the wide outdoor deck. In the evening, guests can also enjoy the amazing African sunsets from the deck. Knysna Manor House is within walking distance of shopping centers, medical facilities, banks, exclusive shops, local craft markets, restaurants and famous the Knysna Waterfront. 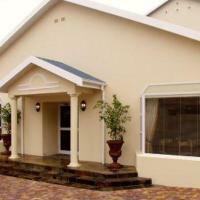 Overmeer Guest House is situated in Knysna along the Garden Route. It has an outdoor pool, and boasts rooms with free Wi-Fi, and balconies with panoramic views of Knysna Lagoon. Overmeer rooms are spacious and have modern furnishings. They come equipped with a TV and DVD player. Some rooms have air conditioning and private bathrooms with a jacuzzi. Guests can enjoy a full English, or continental breakfast on the patio. The Overmeer also features a breakfast room with traditional African décor and an honor bar. The Overmeer Guest House is a 6-minute drive from Mount Joy. Nearby recreational activities include whale watching and hiking. Bicycle rental and private on-site parking are available. With an outdoor pool facing the Indian Ocean, Protea Hotel Knysna has spectacular views of the Knysna Lagoon. The stylishly decorated rooms have free Wi-Fi and satellite TV. All rooms at Protea Hotel Krysna Quays are tastefully decorated with wooden ornaments and have large windows. They have a separate bathroom that comes with complimentary deluxe bath products. Some have a lagoon view, other rooms overlook the historic Krysna Train Station. The heated outdoor pool is set on a uniquely designed sundeck with a poolside bar. Guests can enjoy a range of massages and aromatherapies at the hotel's wellness therapist. Guests can enjoy fresh seafood and fusion cuisine along with beautiful views of the lagoon at Drydock Food Company. 34 Degrees South serves fish, sushi and fresh harvested oysters. The guests can eat traditional Italian cuisin at Limoncello. Within walking distance of Knysna’s attractions, providing guests with easy access to the Garden Route, this modern 3-star hotel offers luxurious accommodations and free private parking. The guest rooms are stylishly decorated with lavish over tones and trimmings. They have luxurious, marble bathrooms with free soap and shampoo products. Russel Hotel offers a traditional,hearty South African breakfast, prepared with fresh ingredients from the region. A full English breakfast is available as well. Knysna Golf Club is 2.5 miles from Russel Hotel. Restaurants such as The Anchorage or Harry B’s are within 440 yards of the hotel. Free private parking is available on site. Situated overlooking Knysna Lagoon and the distant Outeniqua Mountains, the historic Belvidere Manor Hotel enjoys stunning views and a tranquil location. Enjoy a farmhouse breakfast, light lunches poolside or at The Bell Tavern, then savour dinner by candlelight at Caroline’s where local ingredients are served with fine wines. For business guests, the Duthie Room is suitable for small brainstorming sessions to larger meetings, seating up to 40 delegates. Relax by the swimming pool in our beautiful colonial-style gardens (the estate is a nature-lover’s paradise with more than 270 species of birds). Then, retreat to the secluded comfort of the fireplace or the terrace in your own picturesque, spacious Cape-style cottage. Located on scenic Leisure Isle, close to Knysna's only beach - Bollard Bay, this guesthouse offers relaxed beach house living in combination with knowledgeable and friendly service. Cuningham's, with its spacious rooms and lush garden, is an ideal base from which to explore the Garden Route. Play a round of golf on one of the many golf courses. Hiking, cycling and horseback riding are just some of the outdoor activities that will make your stay unforgettable. In the morning, you can wake up to the sound of birds before enjoying a delicious complimentary breakfast. The family-run Ocean View Lodge offers views of the Indian Ocean from the wooden deck. It is located a 25-minute walk from the Knysna Lagoon and a 10-minute drive the Featherbed Nature Reserve. All rooms overlook the outdoor pool and open onto the large veranda. Some rooms contain a spacious dining area. The Lodge offers a restaurant serving a full English breakfast. Guests can make use of the barbecue facilities or enjoy meals at one of the local restaurants in downtown Brenton. Many recreation activities, such as golf, diving and hiking can be organised at the tour desk. Boat trips are also available to explore the area around Knysna Heads. Guests can rent a car to discover towns such as George, Oudtshoorn along the famous Garden Route. A shuttle service is provided at an additional cost. At the tip of Leisure Island and overlooking the Knysna Lagoon, this hotel has an outdoor pool and terrace with panoramic views. Its rooms have a furnished balcony or patio. The sunny and spacious rooms are equipped with air conditioning and satellite TV. Each en-suite bathroom comes equipped with under-floor heating and free toiletries. The Amanzi Lodge boasts a swimming pool and terrace. Guests can relax whilst overlooking the lagoon and enjoy a drink. To explore the scenic area around the lagoon, the hotel offers guests usage of bikes or canoes. Within 20 minutes of driving distance from the hotel, golfers can choose between 3 golf courses to play. The Knysna Elephant Park is 8 km away. Free private parking on site. Amber Guest Lodge offers luxurious bed and breakfast accommodation overlooking the magnificent Knysna Lagoon on the Garden Route. Free Wi-Fi is available in all rooms. The beautifully appointed and spacious suites are decorated in a classic, yet modern style that complements their airy, light feel. All suites open onto the large pool area and patio. From there you can enjoy wonderful views of the lagoon and the surrounding mountains, while watching the ever-changing colours of a South African sunset. Tucked into the gentle sweep of Knysna's Eastern Head, Amber Guest Lodge is the perfect place whether you prefer excitement and new experiences or simply to rest and recharge. This award-winning lodge, located at the heart of the Garden Route, is only minutes from Knysna and provides guests with every conceivable comfort. Offering luxurious log chalets and suites, Tonquani Lodge impresses with its stylish décor and invigorating spa therapies. Visit the spa and treat yourself to a massage or rest on a relaxation bed. Most of the chalets include a private jacuzzi and fireplace, adding to Tonquani’s overall peaceful atmosphere. Whether you would like breakfast in bed or want to relax on a lounge chair in the pool area, friendly staff is happy to help. While your children are being looked after by professional babysitters, you can try your hand at activities such as abseiling or diving. Upon your return, the comfort of your beautifully furnished chalet awaits you. Located only a short drive from Knysna’s town centre, on the banks of the River Goukamma, this farm combines stunning views with a tranquil setting. Overlooking the river, Oxbow Farm offers 2 self-catering cottages set in the midst of forest trees. Prepare breakfast in your fully equipped kitchen before exploring the area either by foot or canoe. The farm lies directly en route to Buffalo Bay (surfers paradise) and Goukamma Nature Reserve. Both cottages feature a deck facing the river and a patio, ensuring you lovely views of the surrounding landscape. 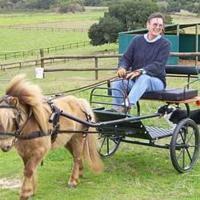 Relax in the comfort of your cosy cottage or discover daily life on a working Miniature Horse farm. Candlewood Lodge is a 5-star lodging located only minutes from the center of town and boasts spectacular views of the Knysna Heads and Knysna Lagoon. With an emphasis to detail, the 6 guest rooms have been tastefully designed and uniquely decorated. All rooms have a private bathroom with shower, a separate area and enjoy stunning views of the surrounding area from private balconies. The large entrance hall houses a library and bar area where guests can take a drink and read a book. Take a walk around the beautiful dining courtyard or relax and sunbathe the whole day by the an outdoor pool, jacuzzi and sun deck. Candlewood Lodge is ideally located to explore Knysna and its beautiful surrounding and is an ideal base to venture further along the Garden Route. Situated along the Garden Route, on a hilltop overlooking the town of Knysna and the Indian Ocean, this deluxe guest house impresses with its stunning location and top facilities. Set in a large private garden area, Villa Mulligan boasts breathtaking views of Knysna Lagoon and various nearby golf courses. Read a newspaper on the 300m² big deck or enjoy a refreshing swim in the pool. Each guest room is exceptionally spacious and has direct access to the terrace. Relax, after a barbecue, in front of the open fireplace in the lounge or play a game of backgammon. Villa Mulligan also offers free wireless internet in the entire building. Perched on a pristine hill overlooking the picturesque Southern Cape town of Knysna, this Bed and Breakfast offers stunning 180-degree views of the gorgeous lagoon, striking heads and surrounding mountains. The Blue Oyster, with its elegantly furnished rooms and cosy lounges, is the ideal place to call home while visiting this beautiful area of South Africa. You can relax by the pool, enjoy a BBQ or catch up on your email. And when you are feeling active, the Blue Oyster friendly staff, proud of their spirit of "home-made hospitality", will be only too happy to assist with information and suggestions so you can make the most of your stay in this favourite holiday destination. Kanonkop Guest House offers luxurious comfort, breathtaking views of the Knysna Lagoon and Heads, serene atmosphere and unique personal service along Western Cape’s enchanting Garden Route. The accommodation in Kanonkop ensures exclusivity and privacy, and the spacious, bright rooms are beautifully appointed and decorated by top South African designers. This family-owned guest house is surrounded by a beautiful garden and small indigenous forest that attracts wildlife and an abundance of birds. Enjoy their antics whilst relaxing on a lounger next to the pool. Knysna, a favourite South African coastal resort town, spoils you for choice with fine beaches, magnificent forests ideal for gentle strolls or strenuous hikes and a wide range of restaurants and shops. The owners will be more than happy to offer advice and help you organise the perfect day. This guesthouse is situated in the wooded suburb of Hunters Home, less than 3 miles from the Knysna golf courses and the scenic Garden Route along the Indian Ocean coastline of South Africa. 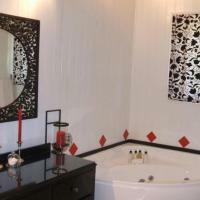 The rooms at the Knysna Country House are decorated with bright colors and have a private bathroom. They have wide windows facing the grounds or the pool area. The rooms have access to the communal terrace or come with a balcony. Guests can enjoy the tropically landscaped garden that surrounds the saltwater pool. The staff at the Country House can help schedule tours in the region or arrange extreme sports like bungee jumping, abseiling or mountain biking. Knysna guests can enjoy breakfast on the sun terrace overlooking the pool. The guesthouse also features large balconies with views of bird life, distant mountains and the Knysna Lagoon. Villa Castollini is a magnificent Tuscan-style luxury retreat set at the top of Western Head. It features an outdoor pool, massage facilities and a library. Every guest bedroom at Villa Castollini is equipped with satellite TV and a seating area. Some rooms have private balconies with views of the garden or pool. Guests can enjoy a continental English breakfast in the cosy dining room. There is also a lounge with an honesty bar and a 74-inch TV with sports channels. Villa Castollini is 12 km from Knysna and only 4 km from the Brenton-on-Sea beach, along Western Cape’s delightful Garden Route. It is 65 km from the George Airport, and free on-site car parking is available. Isola Bella is a charming guesthouse on the water's edge of Leisure Isle, inside the spectacular Knysna Lagoon, a favorite vacation destination along Western Cape’s delightful Garden Route. Step out of your front door onto a beach on the Indian Ocean by the majestic Knysna Heads. Enjoy a light, self-service breakfast on your own balcony or in the comfort of the Isola Bella lounge, taking in the wonderful views of the lagoon. The bedrooms are luxuriously stylish and bright and have private bathrooms. Isola Bella is perfect for small groups, which can rent the entire guesthouse. The surrounding area offers an abundance of adventure and recreational activities. They include fishing, hiking, mountain biking, golf, game drives, forest walks, surfing and swimming. A short walk from the beach, this stylish guesthouse is located in the beautiful town of Knysna and is the perfect retreat for nature enthusiasts. Radiating a warm atmosphere, African Breeze Guesthouse offers a stunning location and cozy interior. Spend the day swimming in the nearby lagoon or the outdoor pool. Comfortable lounge chairs ensure a relaxed time while you dry in the sun and plan your next activities. In colder months, you can unwind in the guest lounge or watch a DVD in the comfort of your room. Your attentive hosts are happy to lend you a movie or 2 from their extensive library. Free wireless internet is also available throughout African Breeze. Wonderful views of Knysna and Knysna Lagoon awaits guests at this guest house, located at the heart of the Garden Route and radiating an exclusive atmosphere. Inspired by its coastal surrounds, Villa Paradisa has been built with an emphasis on outdoor living. Enjoy a swim in the infinity-edge pool overlooking the water. Afterwards, you can have champagne on your very own terrace or in the pavilion next to the pool. With only 4 suites on offer, your privacy is ensured at all times. Make use of your stylish bathroom, including the bath for two, or gaze at the African night sky through the French windows. A turn-down service completes each suite’s luxurious feel. The day can be spent relaxing in the hot tub, tasting different wines and taking pleasure in various beauty treatments. Guests hoping to explore some of the surrounding nature can also participate in a number of activities arranged by your attentive hosts. Set in an indigenous garden in a quiet suburb of Knysna, Stannards provides stylish countryside accommodation along the Garden Route. It features a saltwater pool, a tennis court and nearby golf facilities. Rooms at the Stannards Guest Lodge are individually stylized and some are self-contained. They all feature satellite TV channels and open out onto private balconies. Each bathroom includes a bathtub. A buffet breakfast is served daily and renowned South African wines can be tasted at the bar. Guests can benefit from an outdoor viewing deck during the warmer months or relax by the fireplace during winter. Other facilities of the Stannards Guest Lodge hotel include a well-equipped gym and water sport activities from snorkeling to diving and canoeing in the natural surroundings. Knysna's lively town centre and the popular Leisure Isle are both within 2 km. Free private parking is available on site. Hosted in one of the largest timber-log structures in the Southern Hemisphere, Log-Inn is a 5-minute walk from the Knysnas waterfront and lagoon ferries, 2 blocks from the village shopping center. Boasting a stunning lobby, complete with wooden staircase and stained glass window, Knysna Log-Inn Hotel offers comfortable guest rooms. Relax on your private balcony or opt for a visit to the pool deck, where you can sunbathe on a lounger. The Log-Inn has room service available from nearby restaurants. The hotel has golf memberships to the two world-class courses in Knysna, Pezula and Simola. Other activities include abseiling, forest walks or boat trips. Within 330 yards of Knysna Waterfront shopping area, Rex Hotel offers the ultimate in self-catering comfort. Luxurious rooms and apartments feature modern design, LCD TVs and extra-large windows. Tea and coffee station, a minibar, DVD player, and air conditioning are included in all rooms and apartments. Apartments also include modern design kitchenettes. Guests can enjoy a delicious buffet breakfast at the Rex Restaurant, located on site. Free private parking is available at Rex Hotel. The front desk is open 24 hours. The Rex Hotel is ideally placed to a wide choice of recreational, water, and sports activities. Attractions such as the Knysna Elephant Park is nearby and the Featherbed Boat Cruises is 440 yards away. Situated at the tip of Thesens Island, Lofts Boutique Hotel offers uniquely themed accommodations and extensive spa treatments with an outdoor swimming pool. All with stunning views of Knysna Lagoon. The Lofts boutique Hotel offers contemporary designed rooms decorated with wooden beams. Each room has large sliding doors opening to a private balcony or patio facing the lagoon. The rooms come with satellite TV, tea/coffee maker and extra long beds. At Le Spa Tranquill, guests can enjoy treatments ranging from shower scrubs to hot stone therapy. The pool deck is almost all surrounded by the lagoon and offers a great way of digesting a day of spa. Knysna Golf Club is less than 15 minutes of driving from the hotel. The Knysna Waterfront with its bars and restaurants is within half a mile. Free private parking is available on site. Built to reflect the natural beauty surrounding it, this luxurious hotel is located in the town of Knysna and promises a relaxed stay. Nestled at the eastern head of Knysna, Pezula Resort Hotel & Spa welcomes guests looking to experience genuine South African hospitality. Wake up to stunning views of the Indian Ocean, Knysna Lagoon or the Outeniqua Mountains. The same views can also be enjoyed while golf at the nearby golf course or having a dip in the outdoor pool. Pezula Resort Hotel & Spa offers countless activities to suit your every need. Treat yourself to a massage at the spa or explore the area on horseback. All rooms and suite are exquisitely furnished, with individual décor underlining their luxurious feel. Have a bathtub in your free-standing tub or chat with friends back home using the free wireless internet access. For your convenience, the resort also has a restaurant and bar, leaving nothing to be desired for during your stay at Pezula Resort Hotel & Spa. Located on a 3 acre estate, this property offers luxury rooms with lagoon views, 2 swimming pools and a landscaped garden. It is a 15 minute drive from Pezula Golf Club. St. James of Knysna offers rooms and suites equipped with deluxe bedding and furniture. Room amenities include satellite TV, minibar and a tea/coffee marker. Bathrobes and international adapters are provided for all rooms. St. James Restaurant serves various country-style dishes which include ostrich. Light snacks and English cuisines are also available. It features a wide selection of wines. Located on Knysna Lagoon, St. James of Knysna is a short drive from the fishing, yachting and scuba diving activities nearby. It is one mile from Simola Golf and Country Estate. 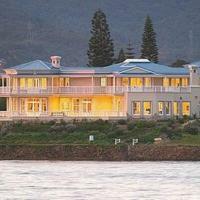 Located in the hills above Knysna, this 5-star hotel overlooks the Knysna River and Garden Route town. It has a spa, swimming pools and a restaurant with lagoon views. The rooms at the eco-friendly Simola Hotel, Country Club & Spa have free Wi-Fi, a flat-screen TV with satellite channels, a DVD player and a stylish bathroom with amenities. Some rooms have panoramic views of the lagoon or forest and include a kitchen and a cozy lounge with a fireplace. The Simola Spa features face and body treatments performed with Africology spa products. Guests can also work out at the gym which overlooks the Knysa Heads and offers state-of-the-art equipment and personal trainers. The Orchard Room serves international cuisine, while the Country Club’s sushi bar offers Japanese dishes, including Teppanyaki. Guests can enjoy refreshing drinks at Sir Roy’s Bar. This 5-star guest house occupies a secluded location on the Garden Route. It provides far-reaching views across Knysna Bay and the beach is just a few minutes’ walk away. Free Wi-Fi is available. The suites at Augusta Bay Guest House feature large living spaces and views across the lagoon towards the Outeniqua Mountains. Each suite is individually decorated, and is equipped with air conditioning, satellite TV and an en suite bathroom. Guests of Augusta Bay have the choice of English or Continental breakfast, which is served in the central atrium overlooking the pool deck. There are many recreation activities available locally, including golf, abseiling, hiking and white water rafting, and the guest house staff can help arrange trips. Alternatively guests can discover many local boutiques, markets and art galleries in the village centre, 5 minutes’ drive away. 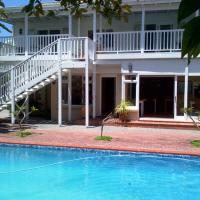 Augusta Bay Guest House is 40 km from Plettenberg Bay Airport. Situated less than half a mile from Knysna Lagoon, this 4-star family-run guesthouse offers tranquil accommodations on the Garden Route. It has an outdoor swimming pool and sun lounging area. Every room at Knysna Stays is air-conditioned and includes an LCD TV with satellite channels and free Wi-Fi . Rooms are available with private balconies with views of Knysna Lagoon or the grounds. Breakfast is made from fresh, local produce and is served daily in the open-plan dining area. The breakfast area has large windows that open to pool views. In the area surrounding Knysna Stays, guests can enjoy bird and whale watching. Knysna Stay is just 2 miles from the Knysna Marina and 3 miles from the famous Knysna Heads headlands.The property also offers value packages for Simola Golf course which is 3 miles away. Knysna Stays offers secure and shaded off-street parking for all guests. With an outdoor pool and jacuzzi facing the Knysna Lagoon, Waterfront Lodge offers spacious rooms with satellite TV and free private parking. Simola Golf Course is 2.5 miles away. 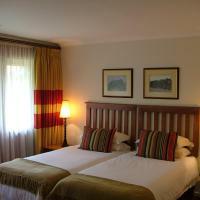 The rooms at the family run Waterfront Lodge are tastefully decorated with bright warm colors and large windows. Some rooms have a private balcony or patio facing the lagoon. Guests can relax and enjoy the sun and bird life at the sundeck alongside the pool. Sauna and Swedish body massage are available as well. The hotel staff can schedule outdoor activities in the region like kayaking, boating and cycling. A continental and full English breakfast is served every morning. Drinks and snacks are available at the bar and barbecue area. The city of Knysna with its restaurant shopping area is within 2.5 miles from the hotel. 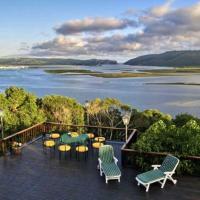 Double Dutch offers bed and breakfast in Knysna and views over the Knysna lagoon. Set in extensive garden, it has an outdoor swimming pool and barbecue facilities. Each room at Double Dutch features satellite TV, a refrigerator and tea/coffee facilities. All have a seating area and a private bathroom with under floor heating. Breakfast is served every morning in the dining room. Room service is also available. Double Dutch is a short walk from Knysna's town centre where guests will find restaurants and shopping malls. Free secure parking is available on site. A few feet from Knysna Lagoon, this hotel in Leisure Isle offers uninterrupted views of the Outeniqua Mountains. It has an outdoor pool, free internet and free private parking. 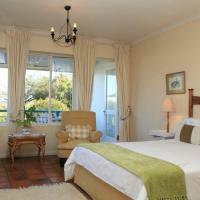 The rooms at the 4-star Knysna Belle Guest House have satellite TV, a tea/coffee maker, a safe and under-floor heating. Some rooms have a balcony or patio with lagoon or garden views. The Knysna Belle serves a rich breakfast on the terrace, which features views of the pool and garden. The guesthouse can also arrange lunch baskets for guests who would like to enjoy a picnic on Leisure Isle’s white sandy beaches. The Belle Guest House has an outdoor swimming pool surrounded by lounge chairs and landscaped grounds.The complimentary bikes or kayaks available from the guesthouse can be used for scenic trips around Leisure Isle. The Knysna is a 10-minute drive from the middle of Knysna. This owner-run guesthouse is along the Garden Route, 100 ft from the Knysna Lagoon. It has an outdoor pool, and offers rooms with private balconies and panoramic views. Bridgewater Bed & Breakfast rooms are bright and have classic furnishings. They come equipped with satellite TV and a coffee maker. Some rooms have private entrances, access to a courtyard and a few provide lagoon views. In the morning guests can enjoy an English breakfast in the panoramic dining room which features Knysna Lagoon views. Bridgewater also has a tour desk that provides information on local attractions. The center of Knysa is a 10-minute walk from the Bridgewater Bed & Breakfast. The Pezula Golf Club is a 15-minute drive away. The Bed & Breakfast offers free on-site private parking. This elegant Cape Colonial house offers views over the Knysna Lagoon and the Heads. It features a saltwater pool surrounded by beautiful lush gardens and bougainvillea shrubs. All rooms at the Bridgewater Manor feature a private balcony with wrought iron furniture. The bright rooms include large windows overlooking the lagoon. The Bridgewater has a breakfast room opening onto the main patio. Guests can enjoy an English or continental breakfast while admiring the landscape. Located at the heart of the Garden Route, it is 1.5 km away from Knysna Heads and its hiking trails. It is 3 km away from Eastford Private Nature Reserve. Falcons View Manor is situated on a hill overlooking Knysna Lagoon, less than half a mile from central Knysna. It features an outdoor pool, a library and free Wi-Fi throughout the hotel. All of the stylish guest bedrooms at Falcons View Manor are equipped with digital TV and hot drink facilities. Every room is air-conditioned and also features a hairdryer and a safe. A full English breakfast is served each morning in the hotel’s elegant dining room, which offers a varied international menu for lunch and dinner. When the weather is pleasant guests can also dine in the tranquil Tea Garden. Falcons View Manor is half a mile from Knysna Harbour, where you can rent a boat and explore the Knysna National Lakes Area. The hotel is 3 miles from Simola Golf Club, which was designed by the great Jack Nicklaus. Falcons View Manor is 24 miles from Plettenberg Airport and half a mile from Knysna Train Station. This well-appointed guest house features a palm-framed outdoor pool, and a breakfast patio with panoramic Knysna Lagoon views. Knysna’s city centre is about 5 minutes away by car. Guests of the Knysna Herons Guest House can choose between English or continental breakfast. Fresh fruit, yoghurt, and toast are just some of the options available. All the rooms are equipped with free Wi-Fi and satellite channels for in-room entertainment. Wall panel heaters, fluffy duvets and coffee makers help create a warm atmosphere. Guests of the Herons Guest House can prepare a barbecue meal, to be enjoyed under the lush trees in the garden. Recreational activities in the surroundings include the Sparrebosch golf course, less than 3 km away. The scenic Garden Route is easily accessible. Guests can request travel information and a shuttle service to several location directly at the Knysna Herons’s tour desk. With breathtaking lagoon views from every room, this 4-star hotel offers a maritime feel in a quiet suburb of Paradise in Knysna. The cozy outdoor-pool area is fringed with greenery. Private patios are featured in all Azure’s suites and apartments. Each self-contained unit has a large private bathroom, stylish living room and a fully equipped kitchenette. Guests can soak up the sun on Azure House’s grounds or have a barbecue while enjoying exquisite views of the lagoon. The pool area is provided with shaded lounge chairs, perfect for a lazy afternoon. Azure House is an ideal base from which to explore Knysna and the Garden Route region, including the Garden Route National Park, which can be found a 15 minute drive away. Knysna River Club offers luxury chalets on the edge of Knysna Lagoon, in the heart of the Garden Route. It offers a private jetty and a pool surrounded by trees. The chalets of Knysna River Club are either set amongst forest ferns or along the waterfront, offering spectacular views of the Lagoon. All chalets include a fully-equipped kitchen and a private balcony. The on-site restaurant is set in the original manor house and offers a selection of sea food, vegetables and meats. The bar is available for refreshing drinks in the evenings. Guests can read a book on the sun beds by the pool or relax in the sauna and jacuzzi. The nearest golf course is 3 km away. The Knysna Train Station is a 5 km away from the Knysna River Club, as is the Kruisfontein Forest. South Villa is in Knysna, in the heart of the Garden Route. It offers modern rooms with private balconies overlooking the Knysna lagoon and Knysna Heads. 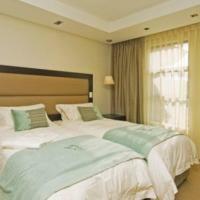 South Villa’s guest rooms are decorated in neutral tones and include free Wi-Fi. Each is equipped with a DVD player, TV and tea-and-coffee-making facilities. Guests can relax in the main lounge with its leather chairs, zebra carpet and cozy fireplace. When weather is sunny, the sun deck is perfect for sunbathing. South Villa is less than a 15-minute drive from the Simola and Pezula Golf Courses. The Knysna Waterfront and Knysna Train Station are a 10-minute walk away. Located in a forest garden, Inyathi Guest Lodge offers chalets is in the heart of Knysna. A freshly prepared buffet breakfast is available in the morning. Each unique chalet is decorated with traditional African arts and crafts. Each has an outdoor seating area and overlooks the garden. A luxurious Victorian-style bath and stained glass windows are featured in some chalets. A continental and cooked breakfast is served daily in Inyathi's breakfast room, which features local artwork. Knysna’s restaurants are only a 10-minute walk away from the property and offer a range of African and international dishes. Inyathi Guest Lodge is conveniently located just off the main road (N2), which runs through the centre of Knysna. The closest airport, George, is 75 km away. This former power station is located in Knysna and offers sunny suites with an iPod docking station and views of the Knysna Lagoon. The spacious sun deck comes with an outdoor pool. Including a private balcony, all air-conditioned suites at Turbine Hotel & Spa are elegantly decorated with light fabrics and parquet floors. The suites have a satellite LCD TV and extra long beds. A full English breakfast is available each morning at the Turbine Hotel. For light meals and drinks, there is a tapas bar and a fully stocked wine cellar. Guests of this boutique hotel can undergo a hot-stone massage or enjoy a refreshing swim in the pool, which faces the lagoon. The sun deck offers a calm spot to read a book or magazine. The 24-hour reception staff can arrange babysitting and shuttles to George Airport, 65 km away. Lagoon and sea cruises can be arranged as well. Located on the banks of the Knysna Lagoon, in the midst of enchanting woodland gardens, Premier Hotel Knysna offers air-conditioned rooms with a private balcony or patio. It offers an outdoor swimming pool. Rooms at Premier Hotel feature a modern décor. All rooms have a flat-screen TV with satellite channels, tea and coffee making facilities, and a private bathroom with a hairdryer. Some rooms have a kitchen. Guests can enjoy regional dishes as well as international cuisine at Salmon Restaurant. The bar serves a variety of local wines and liquors. The pool menu offers fresh juices, smoothies, cocktails, and snacks. The reception of Premier Hotel Knysna is open 24/7. The surrounding area of the hotel offers plenty of outdoor activities such as fishing, swimming, boating or bird watching. Premier Hotel Knysna - The Moorings is just 2.5 km from Knysna town, where guests can visit a wide variety of shopping malls, restaurants, pubs and historical attractions, including the famous Knysna Heads. Situated on a cliff, this lodge features an outdoor pool with panoramic views of the Knysna Lagoon and the Indian Ocean. It offers free Wi-Fi and has spacious guestrooms with furnished balconies. Rooms at the Headlands House Guest Lodge are bright and have elegant décor. They include a seating area, as well as tea-and-coffee making facilities. Each has an en suite bathroom. In the morning, the lodge serves a full-English breakfast with fresh fruit on the sun terrace. Champagne can be enjoyed on the viewing deck. Staff provide information on nearby restaurants. 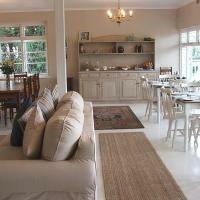 Headlands House Guest Lodge is an ideal base from which to explore the Garden Route. Nearby leisure activities include whale watching, wine tasting and sailing. Free private parking is possible on site. This Victorian guest house in Knysna offers a secluded swimming pool and is a 10-minute walk from the Knysna waterfront. Its country-style rooms come with a TV and coffee/tea facilities. Chequered or flowered bedspreads and curtains decorate the cosy rooms at Yellowwood Lodge. Each room has large windows and elegant furniture. Breakfast is served daily in the English-style dining room with its wooden tables and clocks. Restaurants in Knysna’s centre are a 10-minute walk away from Yellowwood. Oriental carpets and antique decorations make the spacious living room a cosy spot to read a magazine. Its fireplace offers some warmth after a refreshing swim in the pool. Situated in the centre of Knysa, the guest house is a short walk from markets and shopping centres and is 100 metres from Knysna Mall. Guests can drive up to Knysna's forest or the Knysna Elephant Park, both 10 km away. Knysna Heads is 6 km from the lodge.